This book explores the political, economic and regulatory context in which credit regulation is taking place following the global financial crisis. It suggests that current neoliberal economic policies favour multi-national corporations rather than consumers and examines regulatory responses to the internationalization of consumer finance protection. 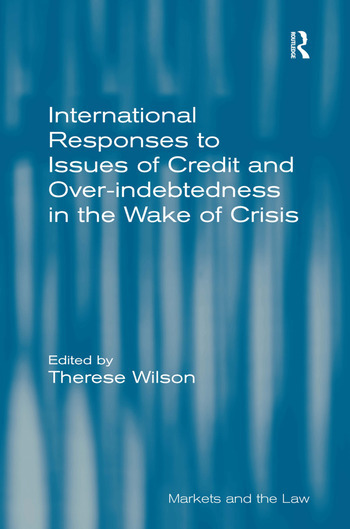 Detailing how EU consumers have been affected by national economic conditions, the book also analyses the lending regimes of Europe, Australia, the US and South Africa and offers suggestions for responsible lending to avoid over-indebtedness and corrupt mortgage-lending. Finally, new approaches and directions for consumer credit regulations are outlined, such as protection for small businesses, protection against risky credit products, reorganization of mortgage securitization and the possibility of a partnership model to address financial exclusion. The book includes contributions from leading names in the field of consumer law and will be invaluable to those interested in banking, business and commercial law. Dr Therese Wilson is a Senior Lecturer in Law at Griffith University and a member of the Socio-Legal Research Centre. She currently teaches corporate law, banking and finance law and international commercial arbitration. Therese chairs the board of Foresters Community Finance Ltd and is a member of the board of Social Investments Australia Ltd.